The first time you come across it, it can feel a little confusing. You check in, get your boarding pass, and check your bags (if any). But then before you can get to your gate, you usually have to find this other little desk hidden off in a corner somewhere. You pay your exit tax there (you did remember to hang onto enough local currency to pay that tax, didn't you?) and get a little slip of paper or something. Slip of paper in hand, you are finally allowed through to your gate. Once you've done it a few times, it becomes second-nature. But why on earth would you do it if you don't have to? In the case of Colombia, it's probably because you don't know any better. Or even if you do know you don't have to pay it, you might not have any idea how to go about wrangling that mythic tax-free departure. And all of it was either tantalizingly ambiguous or frustratingly contradictory. We were told that the tax was $33 per person, or maybe $66 per person, or maybe that there was no tax if you had a receipt, but only if you stayed less than 60 days, not to mention the $5 tourist tax, which may have just doubled, but the other tax might be included in your ticket, or might not, and whatever happens save that receipt, and make sure you get your tax exemption before you leave the airport when you first arrive in Colombia, and did I mention that if you lose that receipt you're in the big big trouble? It was all so confusing we vowed to figure it out when we got there, and then try to write it all up as clearly as possible, to try to save someone else the headache we gave ourselves. And so here we are. Let's get to it. After reading all those forums, we were quite paranoid about losing that all-important receipt. Imagine our concern, then, upon exiting immigration in Bogota and realizing we didn't have a receipt. All we had was the remaining page from the forms we filled out upon arrival (pictured to the right). This clearly wasn't it – it was just a listing of rules and regulations, not signed or stamped or anything. It didn't have our names or passport numbers on it, or anything specific to us. It was just a generic little legal disclaimer. But we hung onto it, just in case. We wanted to avoid the big big trouble. We wandered about, and asked everyone we could for assistance, from the border guard who stamped us into the country to the exceptionally helpful (and friendly) gentleman behind the airport's "Information" desk. We got our intel. There was nothing we needed to worry about before leaving the airport. And yes, as long as you'd been in the country less than 60 days, you didn't need to pay the exit tax. Everything would happen when we returned to catch our plane home. It all sounded pretty straightforward, actually. Ok, this really isn't on-topic, but make damn sure to give yourself enough time at the airport. We got there at 6:30am, giving ourselves a full two and a half hours, and we barely made it. The security at the Bogota airport is impressive. We went through five (count 'em – five) security checkpoints before getting on our plane, including several bag searches and one very thorough pat-down. I've never felt so safe sitting on a plane. No one was sneaking anything on board. But all that security takes time. The lines were crazy, even at 6:30am. Give yourself three hours just to be safe. Really. You're doing well. Go get into line to check in (or if you have a partner-in-crime saving you a place, go join them). 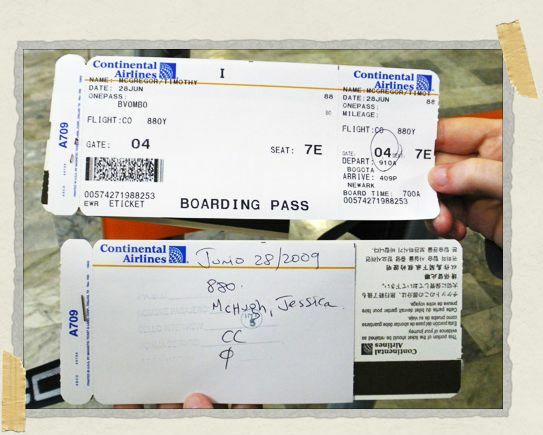 Before we get to checking in, I should note that we flew with Continental, and we bought our tickets through Expedia. That might make a difference for what happens next for you. 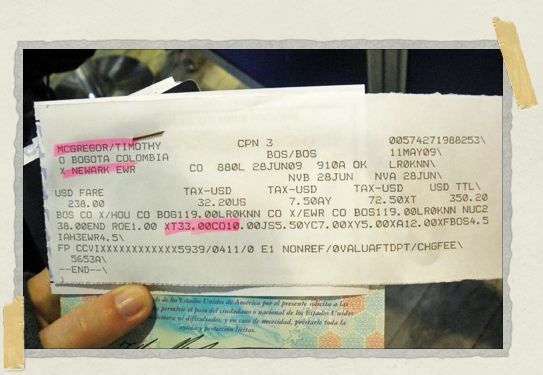 The Tasas Aeroportuarias Internacionales – $33 USD. This is a tax that everyone pays. In most cases, it'll be included in the fare you paid for your ticket. My understanding is that it's especially likely to be included if you booked through Expedia (it was for us). The "tourist" tax – either $5 or $10, depending on who you ask. We either didn't pay this one at all, or it was included in our ticket price. So again, the next part is specific to how it worked for us flying with Continental. 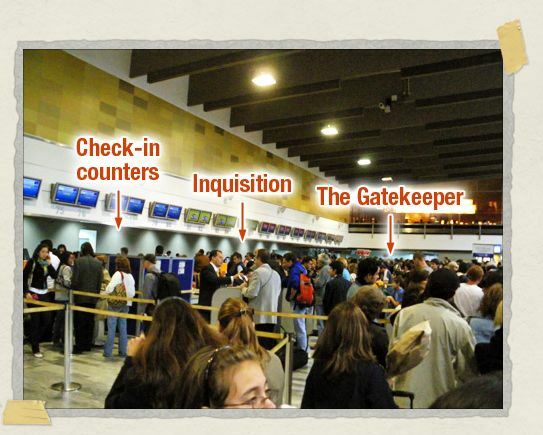 Now you have two obstacles to overcome before you can get to the check-in counters. Let's call them the Gatekeeper and Inquisition. The highlighting there was done by the Gatekeeper, not by me. Note the highlighted item reading XT33.00. That probably refers to the $33 USD Tasas Aeroportuarias Internacionales that I paid along with my ticket. After the Gatekeeper you move on to Inquisition. In the US, they just ask you the Big Three Questions – who packed your bags, did you ever leave them unattended, and did you accept any gifts. In Colombia, they dig deeper. What do you do for a living? What was your purpose in Colombia? Where did you go? Who purchased your ticket? How did you pay for it? You can't go through as a couple – each of you must talk individually to your own inquisitor. But it really only takes a minute or so, so don't worry. We double-check with them that we didn't need our exento impuesto timbre nacional anymore, and they said we didn't. They were right. From here you just need to get into the long line heading towards the security checks. And remember, there are a bunch of them. First there's the usual "metal detectors and X-ray machines" variety. Note that there may be two lines here, one of which is only for the elderly and those traveling with children. If your line seems surprisingly short, make sure the sign next to it doesn't say anything about "niños" or you might be made to move to the end of the other (longer) line. After you get through this security check, you're ready to move on to the next one. There will again be two long lines, but this time they're lines for men only and for women only. There's nothing to indicate this until all the way at the front of the line, so again, keep an eye on who you're in line with. If you're starting to notice a certain uniformity of gender in your line, make sure yours fits in. At the front of these lines is the bag check. They'll probably go through pretty much every pocket in your backpack, so be ready to do a touch of repacking afterwards! From here you move on to the very thorough frisking (hence the "men only" and "women only" lines). Next you're home free! Well, almost. There'll probably be one last X-ray and metal detector to go through once you get to your gate. Note that you can't take any liquids on the plane, even if you just bought that bottle of water from the kiosk next to the gate. When you arrive in Colombia, immediately after you get your passport stamp, you'll walk through a short hallway (past some bathrooms, wheee!) to the area where you pick up your checked luggage. Even if you don't have checked luggage – like us – you still have to walk that way. In that space, to the left of the luggage area (you know the place where your luggage goes round and round and round and round) there's a desk where you are (in theory) also supposed to be able to get your exit tax exemption stamp/form even before leaving the airport. There are signs above the desk that mention impuestos and what not. So again, this little desk is to the left of the luggage collecting space and it's also to the left of the lines that will form where they search your bags before you exit the customs area (it's all in the same place). From our experience (arriving before 5am) and from reading online, it sounds like this desk is rarely staffed. So the best bet would probably be to stick with the plan outlined above. I was able to do all this Tax stuff at Medellin airport, where I had a flight with Avianca that made a connection to Peru the same day. A last thing… I measured the time for getting through Bogota airport, from domestic arrivals to onternational departures, it was 27 minutes, give or take 10 minutes for the free shuttle bus from one terminal to the other. It seems that somehow there is a penalty for checking in to US bound-flights, or at certain hours of the day. Queues were very short when we transited. Thanks for your warning though… it made us be very diligent at all the procedues and push through as quickly as possible. I measured the time for getting through Bogota airport, from domestic arrivals to onternational departures, it was 27 minutes, give or take 10 minutes for the free shuttle bus from one terminal to the other. LOL! Murphy's Law, I suppose. Well, I'm glad you made your connection ok, anyway! It seems that somehow there is a penalty for checking in to US bound-flights, or at certain hours of the day. You know, that's an interesting point. Because the whole reason we were taking such an early flight is that there were (at the time) no flights departing for the US after 9am or so. Maybe you're exactly right: maybe all the flights to the US are in the early morning, and that's when they run the crazy security we saw. Then, in the afternoon, when no flights are going there, security can relax to normal levels. Sounds plausible to me, anyway. Your advice was spot on and very helpful. I arrived at 5:30 for the same 9:00 to Newark and I am now sitting in the Avianca lounge, drinking Cafe de Juan Valdez, with two hours to spare. This is far better than standing in a queue looking at my watch wondering if I am going to make it. I think I managed to arrive just before the rush, so there were no lines at the multitude of check points, and everyone was very polite. Hey Scott! That's awesome news! I'm glad it went so smoothly for you and that our advice was helpful too. Next time we head to Bogota and back, we'll definitely take a page from your book and arrive at the airport at 5:30am. It sounds like it was a breeze at that hour! Hey, thanks for all the info. I've been going through the same trouble trying to figure out how much I need to bring to the airport. But I'm still unsure if I have the pay the $33 because I didn't book through Expedia or with Continental, I'm flying with Jetblue. Anyways all the info was great and I'll bring some extra US dollars with me to the airport when I arrive extra early for my flight. Hey Bo! Glad to hear our tips were helpful. Fingers crossed you won't have to pay the $33. And enjoy your time in Colombia! We found Bogota to be really friendly and absolutely beautiful. Hi nice post and really useful for me that am going from Bogota To Toronto so am lost about the tax. If you are still in Colombia it would be fun that you know San Andres. Thanks, Hector! I'm glad you enjoyed the post. I just checked out photos of San Andres online and it looks stunning! Thanks for this info, I'm actually set to fly out of Bogotá in 3 days and I was so clueless. The problem for me though is that I will actually be returning to Bogotá in 4 weeks because I work here. So I'm still not sure if I need to pay any of these taxes. But great info nonetheless. No worries, it's our pleasure to help! And my fingers are crossed everything goes smoothly for you. I hope to be getting back to Colombia for a long stay (179 days! )– previously when I had been there I got the impression the tax was based on the number of days I was there. Hoping that is not the case! From what I read about the three taxes none seem dependent on duration of stay. Great information – and you are right about feeling safe due to the security checks. Wow, half a year in Colombia? We're incredibly jealous! Hope you have a fanstastic time! I just wanted to supply an update on these taxes since I just went through the hassle of trying to make sense of this myself (of which your post here was of great help). The Tasas Aeroportuarias Internacionales tax is now $34 for stays of less than 60 days. The impuesto de timbre nacional is now $36 (what a pain figuring out this one was!). It's also referred to as the Colombian Residence tax and if you buy a one-way ticket originating in Bogota then there is a good chance this has been added into your ticket price. If so, you should be able to get it refunded once you show up to the airport and can then go through the tax exemption process. It's always worth giving the airline a call after purchasing your ticket to inquire about this tax though. I haven't crossed into Colombia yet but I think the 'Tourist Tax' is charged on your way into the country but I could be wrong on this. Thanks so much for posting such a detailed update! This post is 3 years old, but it's still coming up in Google searches. I just got back from Colombia a few days ago and I thought I would update a few things. First, the new terminal is open and it is very modern and clean. I can't compare it to the other terminal, but I can compare it to many new European airport terminals you see these days. The pictures above no longer apply, but you do have to seek out a window where you get the "tax exempt" paper before checking in. Nobody tells you this and the line is VERY long for the airlines. I wonder if people have to wait in that line twice if they haven't read the information on this page. Get your tax exempt form FIRST! At any rate, once in line for the airline, there was no gatekeeper for us. Nobody asked us how much money we make or other personal questions. It was a basic airline check in, equal to that of any US airport. After passport control we went through security, and again it was a big NON event. We didn't even have to take off our shoes. Nobody looked through our bags. We did not have multiple layers of security. Nobody frisked us. We just put our carry on bags through an x-ray and once through a standard metal detector we were ready to walk to our gate. We did notice the place growing more and more crowded as the time neared for our flight. We had arrived 3 hours early based on the advice given here. As it turns out, 2 hours would have been plenty. Maybe lines would have been even longer at that time though. So no frisking. No bag searches. No gatekeepers. Just standard airport stuff. The only real hassle was the money exchange girl past security who tried to rip me off by 30 dollars, until I made her recount the money. Be careful there. Happy and safe travelling everybody! Hey James! Thanks so much for stopping by with an update. We've been so busy checking out so many other countries in the past few years that we haven't had a chance to return to Colombia since our visit in 2009. (Though we would like to soon!) It's great to know that things might be getting a bit smoother at the airport in Bogota! We just came back from Colombia and here is an update to the exit tax situation: unless you are staying for over 90 days no tax is being charged. 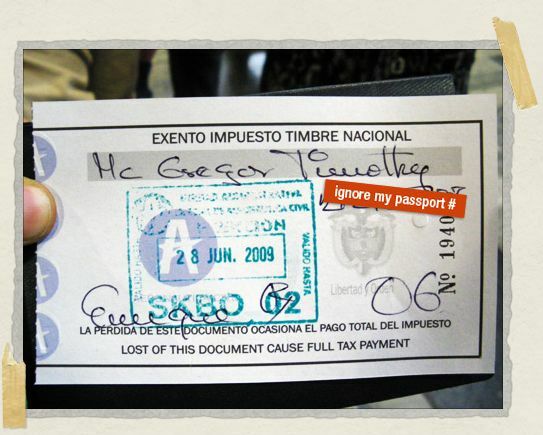 You do need to go to the Aeronautica Civil desk (this is in Cartagena) to get an exemption stamp when checking back for the return flight. The airline we flew (JetBlue) did not charge the tax either as part of the fare – we checked – and the check-in agent said had they charged it it would have been refunded. Hope this helps. I will be travelling to Cartagena in May and will be sure to leave my experiences for this year. Currently it seems the tax is now up to $38. However, to make strange matters worse.. We're flying on Spirit Airlines ( I know I know ) and in their tax breakdown.. it is showing a $92 Colombia tax! Rip off, much! Beyond that, I'm looking at a one way flight, CTG-FLL and even on THAT flight they are charging me a $17.50 US DEPARTURE TAX! Insane! So.. hopefully no one else books with Spirit. I'll hopefully pop back by with an update. Thank you so much for this blog post! Even though it was from '09 still its sooo helpful as well as are the recent posts. I am a dual citizen (Colombian/American) flying with a U.S. Citizen Minor daughter and will report on THAT scenario after AUG 26 in regards to BOG/FLL flight… EUROPEAN STYLE as the BOGOTA airport was described now is right on! I was speechless returning this year since last I flew in 2003 it was exactly as the pics and posts mentioned. NOW it is breathtakingly gorgeous! I WAS A MONTH AGO IN COLOMBIA TWICE, IN MAY & RETURNED TO US IN JUNE, LATER IN JUNE THRU JULY. MY FIRST TIME I DID NOT KNOW THAT AMERICAN RETAINS THE COPY OF THE TAX EXEMPT PAPER, I THOUGHT I LOST IT, AND HAVE NO WAY TO GET IT, IF YOU KNOW HOW TO GET IN TOUCH WITH "AERONAUTICA CIVIL OF COLOMBIA" I WOULD LIKE TO KNOW. THE SECOND TIME I WAS PREPARED A LOT BETTER, BESIDES FINDING OUT THAT AMERICAN RETAINS THE TAX EXEMPT PAPER AND RETURNS IT IN A WEEK TO AERONAUTICA, SO I MADE A COPY OF IT (IT WAS NOT SO EASY)AND DIDGETAPAPERFROM AMERICAN GIVING INSTRUCTIONS TO THE PERSON THAT PAID IN THE US FOR TICKETS SO THE PERSON GETS THE TAX BACK. I STILL DO NOT KNOW WHAT TO DO, OR HOW TO GET IN TOUCH WITH THE AGENCY SO THEY GIVE ME A COPY BUT IS A WASTE OF TIME SINCE THEY HAVE TONS OF STUBS TO TRACE THE NUMBER THAT BELONGS TO ME. THANKS FOR YOUR NOTES ON YOUR EXPERIENCE, I ENJOY THEIR PEOPLE, COUNTRY AND MUSIC. Hope this will be helpful as an update. My experience is as a US citizen who stayed in Colombia for less than 60 days, which I think is still relevant for who gets to not pay for this Timbre Nacional, basically those who are not Colombian nationals or residents and have stayed for less than 60 days. My ticket was a one way Cartagena-New York on JetBlue, and the Timbre Nacional was included in the ticket price, which happened to be an an award ticket with JetBlue points. You have to go to the govt counter to get the exemption voucher before getting in the check in line, and then present it to the check in agent, who issued me a refund receipt for approx $28 to be refunded to the credit card I had paid with previously. Unfortunately, the refund did not show automatically yet, approx 60 days after the flight. Just called Jetblue, eventually transferred to TrueBlue dept since it was an award ticket, had to explain the basis of this refund (make it clear it is an exemption given to non Colombians and non residents) and provide the details on the refund receipt. They said they put through the refund and it should show up within a couple of weeks. Guess you have to hang on to the documentation and watch for the money to actually show up. The reason I will never return to Colombia is due to the way the federal police treated me at the airport. After going through the normal security, they forced all the passengers to receive an X-Ray of their internal organs with no protection. I protested and they informed me that I would be arrested indefinitely until I complied and that I was on their land and had no rights to refuse. This X-ray is very different from the millimeter radio wave scans done in the USA. This is a full powered X-ray. I could not believe they treat their innocent tourists like this, who are willing to risk all the dangers in Colombia. I highly recommend anyone who is thinking about visiting Colombia to avoid it. Arrived home from Bogota on Jan 31, 2016. I was in Colombia for 14 days. You no longer have to go to a separate counter to get the exception stamp before you check in. The airport tax and tourism tax was included with my plane ticket.I flew with delta. You can only use the check in kiosk if you have carry on only. Only headache was you have to get on the line to check in, but it's your meeting with the "gate keeper" asking you why your in Colombia, etc. They ask you how many bags you are checking in. They take your bags and have them sit there between them and the check in counter. Then you have to get into another line to get your boarding passes and finally check your bags in. When you get to the front of the line, a delta employee asks which bags are yours and they bring them up to the counter for you. It was a bit confusing, but in the end wasn't that bad. I had a 11:45 PM flight so I am unsure if they do this during the day as well. 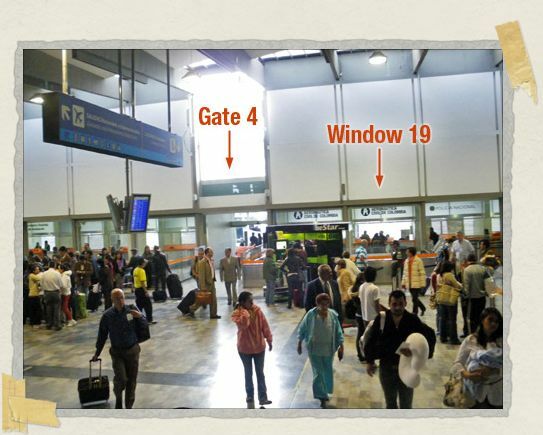 Give yourself plenty of time to get to the airport in Bogota. The traffic is really bad. Overall the airport process is much better than the one time I visited 10 years ago. Recently I flew Viva Colombia from Bogotá to Quito. I bought the ticket via their website and a departure tax of US$38 was automatically added. When I checked in at the Viva Colombia counter in Bogotá, I asked for a refund for the tax since I had been in Colombia less than 60 days. After some searching for cash, the gate agent paid it back to me in pesos. Jet Blue out of Bogota – before you get in line, get a stamp in your passport at the tax counter. The "gatekeeper" checks for this and will direct you to the counter before you stand in line if you forget. Refund via credit card a few weeks later. LAN (not LATAM) out of Cali – I carried on this flight and forgot all about the taxes. When they started boarding the flight the gate agent paged me and they refunded the taxes right there in pesos. Just what I need, pesos five minutes before departing the country! 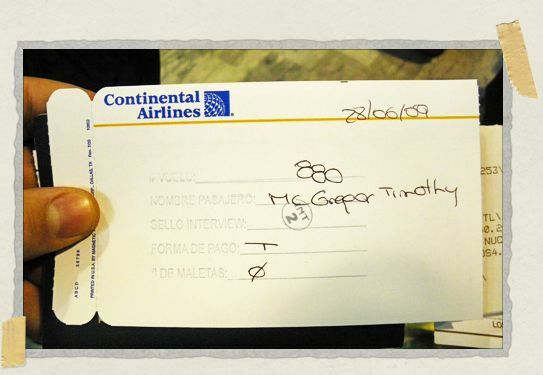 Copa out of Bogota – no need for the stamp at the tax desk, I asked twice to confirm. I assume they didn't charge the tax when the ticket was purchased. The ticket was purchased by my employer and I forgot to check. American out of Bogota – again you need to get your stamp before you get in line. "Gatekeeper is very helpful directing you to the proper counter." After you check in you have to wait for a manager with a money belt to come and refund your taxes in pesos right there on the spot. Only one money bag so the wait can be a bit. American Airlines out of Cali – first you get in line to check-in/check a bag, at the ticket counter they take your bag and hold it behind the counter but do not give you a boarding pass. Instead they give you a small carbon copy form. 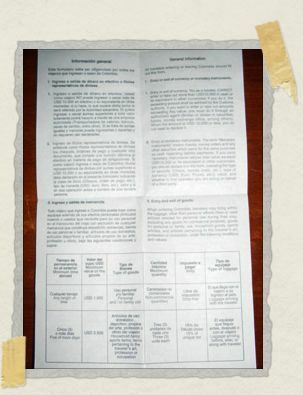 You take that form to a nearby window (they direct you) and pay the tax in pesos. There they write on your form and keep one copy. Then you return to the ticket counter, and just hover behind the agent you saw the first time. This creates a bit of a clusterf#%k and cross your fingers that your agent isn't helping a family of 10 with 30 checked bags when you return. The agent will take your form, keep one copy and give you the final copy with your boarding pass and send your bag on it's way. Then you take that form to a different line where they give you back the taxes you just paid. I. Am. Not. Kidding. Strangest procedure. Anyway, since I travel so often I thought I'd chime in to let everyone know that one set of guidelines is not going to cover every situation. Procedures vary at the same airport, by airline. 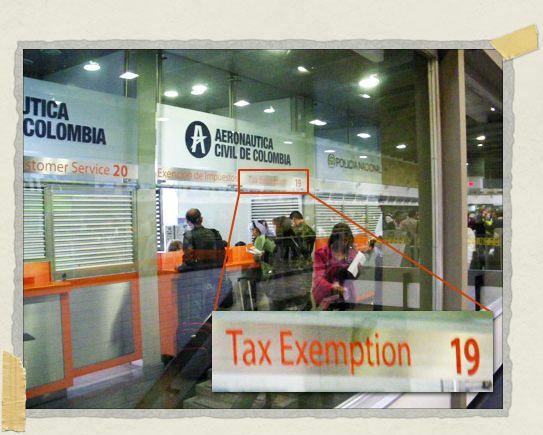 And American handles taxes differently in Cali versus Bogota. My advice – check to see what taxes were charged with your ticket. Ask the "gatekeeper" for your airline for help. Great info! About to jump on a flight guy from Bogota to Cancun tomorrow and this was a huge help! Thanks a bunch!